Despite his heavily reported on misogynistic tendencies, many women voted for Donald Trump this 2016 election. While the Republican nominee suffered a great loss of support when a staggering amount of sexual harassment reports came out during October, the polls showed he wasn't abandoned entirely. In fact, by Oct. 25 a poll conducted by the Pew Research Center showed that 36 percent of women were still voting Trump, compared to 52 percent for Clinton. According to CNN's exit poll report, the statistics show that roughly 42 percent cast their ballots for the Republican candidate while 54 percent of women voted for Hillary Clinton. However, 70 percent of the women who voted for Trump were white, whereas 12 percent were black, 11 percent were Latino, and four percent were Asian. 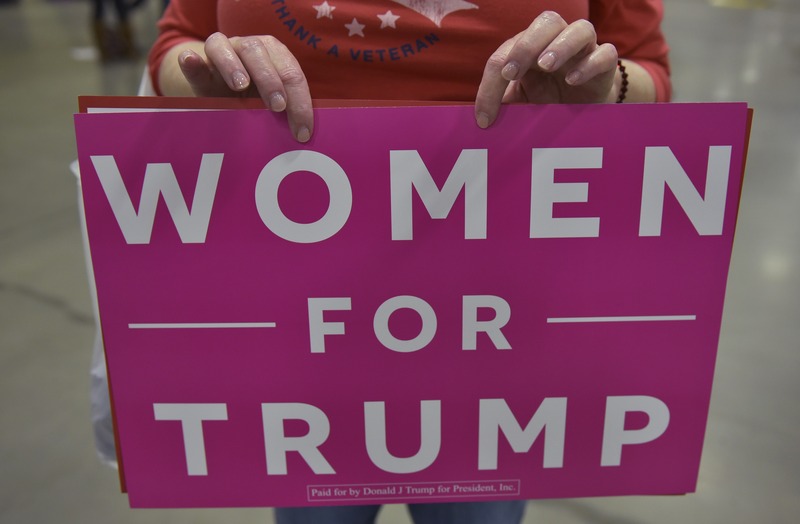 As Bustle reported earlier in election season, many women who planned to vote for Trump did not agree with his treatment or opinion of women; they might have sided with his other ideologies, such as immigration reform and pro-life laws. Many people — from politicians, congressman, to constituents — endorsed and gave their support to Trump, with reasons varying from they believed he could get the country out of the economic crisis to Republican loyalty. It's also interesting to note that Stephanie Coontz, author of A Strange Stirring: The Feminine Mystique and American Women at the Dawn of the 1960s, Marriage, a History, argued that women for Trump are often times women who uphold traditional family values. She was quoted as saying in an interview with Vox, "Women with less economic or personal autonomy are often drawn to a culture of family values that emphasizes men’s responsibility to look after women. Women who have a shot at achieving or competing on their own emphasize equality, supporting the kind of policies that make it possible for them to move up in their jobs and combine work and family." While almost half of women voted for Trump, an overwhelming amount of them were white females, helping the candidate cinch the lead. The urge to blame others for the outcome can be overwhelming, but it's important to remember that women had a huge voice in this election — and a lot of them wanted the results to go this way.